Many of us get used to obstacles in our daily life. We often settle for less and put up with challenges, because we do not realize what we are missing. 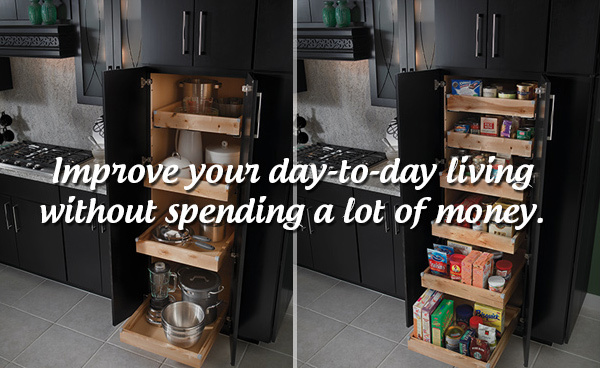 One example to easily improve your day-to-day living without spending a lot of money is organizing your space. Many homes do not come equipped with a well-organized layout or one which is created with your personal needs in mind. You do not necessarily need a huge amount of space in order to create a set-up that makes your life a lot easier. The most important aspect is to have easy shelf access. We offer many different materials and styles for you to design the space to suit your specific needs. With guidance from our friendly staff, you will be able to lay everything out and decide what you need to make you organized and your items easily accessible. ASA Cabinets has durable, practical and appealing materials for your selection. When your space is organized, your day-to-day life becomes simpler and more streamlined. This, in turn, can improve your state of mind and your overall well-being. Everything will have its own place and will be at your fingertips. ASA can provide some eye-opening ideas for you. Come visit our showroom or give us a call.